SU-PER-BOWL! One week til' go-time, football fans. My beloved Denver Broncos are contenders (and obvious favorites - duh!) in this year's national championship...be-YOND excited. Now, I love a heaping mound of buffalo wings, ultra-cheesy nachos and loaded potato skins as much as the next screaming, drooling, beer-guzzling football fanatic, but sometimes it's ok to have something on the buffet table that will balance out the grease & carbs. 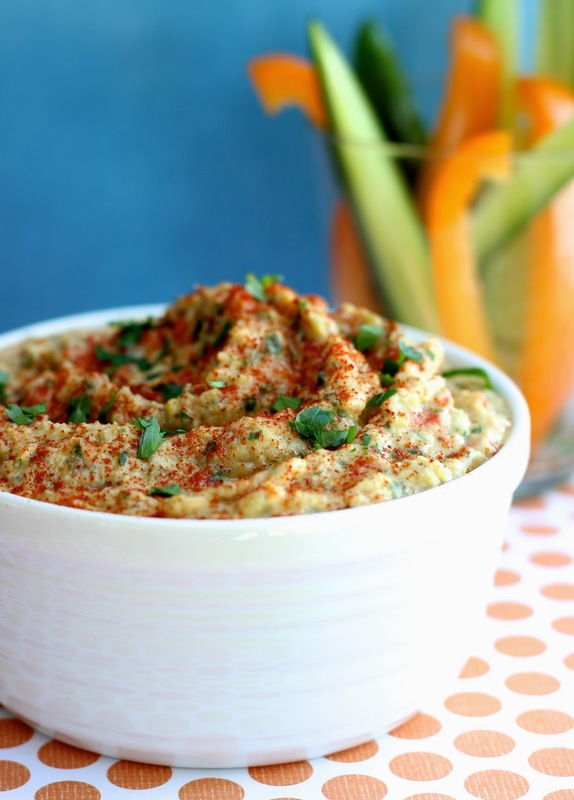 This is a great, do-ahead dip for any gathering...it works in all seasons and is a great, completely vegan alternative to the gloppy, mayonnaise-y artichoke dip we usually indulge in. Serve it with warm, toasty pita triangles or crunchy veggies...it's packed with bright flavors and has a delicious, creamy consistency. Enjoy it without an ounce of guilt...you won't feel like you are missing out on a thing! In a food processor, combine the artichoke hearts, garlic, cannellini beans & olive oil. Puree until very smooth. Add the lemon zest, lemon juice, capers, roasted red peppers, parsley and basil. Pulse the mixture in several one-second intervals until ingredients are well incorporated and red peppers are finely chopped but not totally smooth. Season with salt & pepper to taste. Serve immediately or let flavors mingle for several hours or overnight in the refrigerator. Sprinkle sprinkled with paprika and serve with warm pita trianlges or veggies for dipping - I love persian cucumber slices, bell pepper strips, & jicama spears. This recipe was part of a great collaboration for a healthy, 3-course dinner with myself & Kin Community, Beth from Entertaining with Beth and Sarah Carey from Everyday Food. Click HERE or on the video screen below for the step-by-step video of my Mediterranean Artichoke Dip and links to Beth & Sarah's videos...you will love their recipes!